Everyone can learn to read. If you are between the ages of 4 and 114, you can learn to read English well. We can show you in simple and easy steps how to read everything you desire. You can gain or sharpen your reading skills. Reading is not complicated. If you are struggling with reading basics, you may not believe that statement. You may have put out your best efforts and still failed. You may have tried many other programs, including phonics programs, and still effective reading has evaded you or a loved one. It does not have to be that way. If you can speak English, you can be taught to read English. As with all things, it will be easier for some than for others, but you [or your loved one] can make your dream come true. Many people find reading frustrating, difficult or mentally straining. The main reason for this is that they are reading the wrong way! It is not their fault. It is the way they have been taught. A little over 100 years ago almost everybody could read well. Then a “new and improved” method was introduced which has drastically reduced reading skills! Popular teaching methods in schools all over North America tell students to memorize words. These are called sight words. Students are expected to learn to read by memorizing common words. Some students have excellent memories and will do well in this system, but many will not. They will struggle and hate reading. Performance in other subjects will likely suffer because of poor reading skills. Some will not learn to read at all and will try to cover up what they consider to be an embarrassing failure. However, EVERY single student - no matter how good their memory - will be limited. Consider that the English language has between 750,000 and 1,000,000 words. No one can memorize all those words! But with our method, anyone can easily learn to read the majority of them. The correct way to learn to read is called phonics. Phonics is simply learning the sounds that letters make and putting them together to form words. There are only 44 sounds in the English language. Anyone who speaks English already knows all the sounds, learning to read is just a matter of learning which letters make which sounds and when. English is one of the most colourful and descriptive languages on earth. We borrow words from other languages and adopt them into our own. In spite of this, almost 90% of the words in the English language are either totally phonetic or have large phonetic parts. A few words have exceptions to the rules, but they can be easily learned. If you enrol in our program, you will have a one-on-one Reading Instructor Specialist to guide you into the wonderful world of words. Although many phonics learning centers and programs are effective with reading help, some students still struggle with reading. The main reason is that they do not teach all the phonetic rules or do not put them in a simple, easy-to-understand way. Some phonics is better than no phonics, but without a complete, easy-to-learn system, many students will still find reading frustrating. 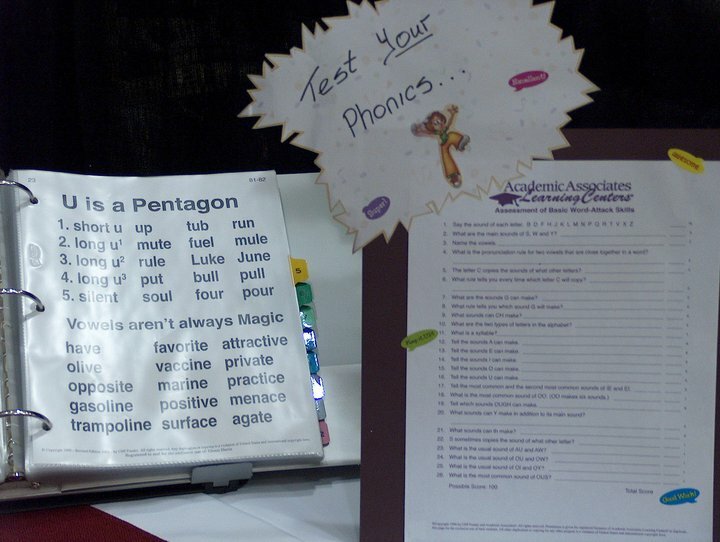 We use the Academic Associates systematic phonetic program. With these easy steps everyone who can speak English [98% effective] can be reading with only 30 - 60 hours of instruction [on average]. In fact, it will come automatically. By the time the first lesson is complete, everyone will have read 300 words! Some schools take an entire year to accomplish what we can usually do in a few hours. So, if you have been discouraged with reading, don't give up. Reading help is here. You can learn to read or improve your reading skills. Facebook: Learn To Read Prince George and the World. For all the details see our Frequently Asked Questions page.